Valentine's Day 2015 - a gift guide for the whole family! 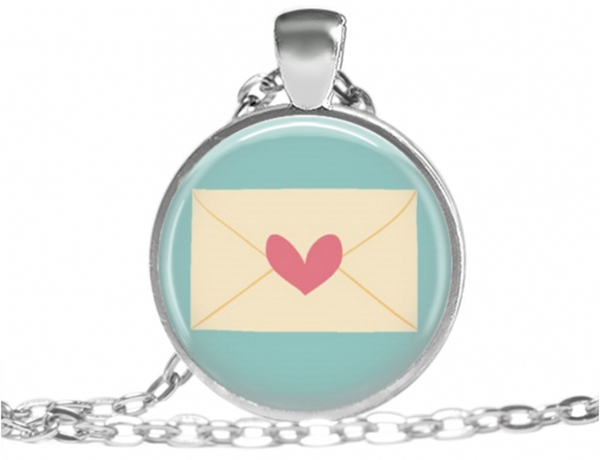 Valentine’s Day 2015 – a gift guide for the whole family! If your heart’s filled with love but your mind is blank on what to gift your big and little darlings this Valentine’s Day, this post is for you. We’ve scoured the internet for all manner of sweet things that will make the heart flutter with the warmest of fuzzies. So if you want sweet without resorting to chocolates and heart shaped candy, do click on through! 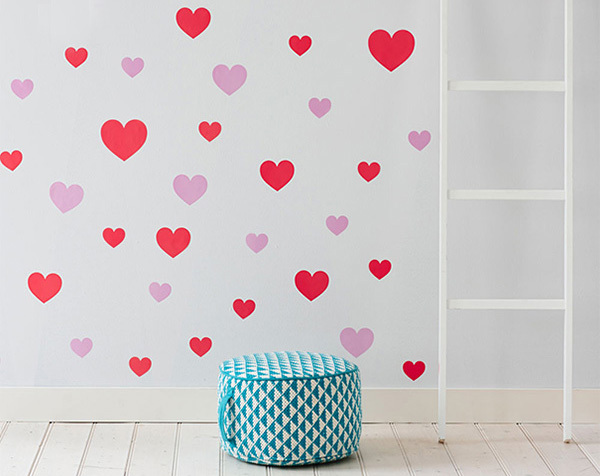 Wear your heart loud and proud on your walls this Valentine’s Day thanks to the fantastically fun Hearts Wall Stickers from the Adairs Kids range. You get 19 stickers in a pack for just $13.95 and the kids can let the love flow all over their bedroom, a wardrobe, their bed and even the back of the door. Find Heart Wall Sticker packs at Adairs Kids stores nationwide or online at Adairs. Pink is the colour of romance. 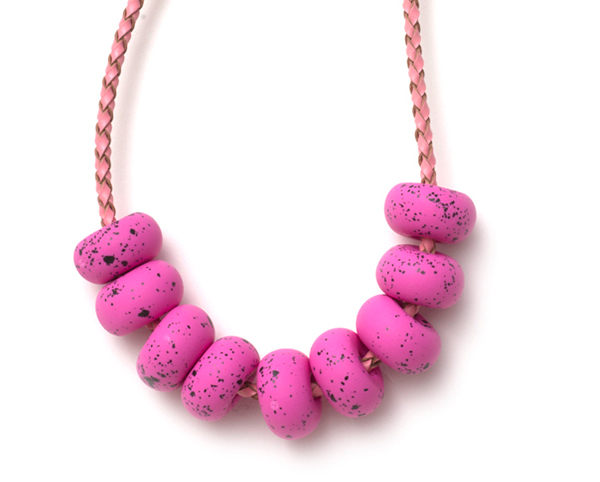 It’s also the colour of this yummy gelato inspired silicone Messina Raspberry Nine Bead Necklace from the talented Emily Green. Priced from $49 with the choice of a braided leather or silver chain, there’s no denying it sure looks good enough to eat! It’s said that a beautiful blanket is like a giant hug and we don’t doubt it for a second with the luxe Little Bonbons Retro Hearts blanket in navy. Sized 100 x 80 centimetres, it’s perfect for Valentine snuggles with your little one. Available directly from Little Bonbon for just $49.95. 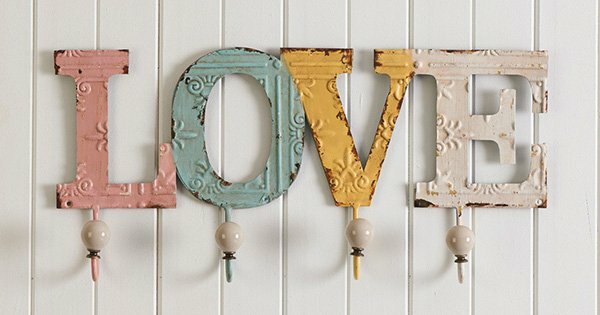 Nothing warms the cockles of a mum’s heart quite like kids who pick up after themselves, which means there’s plenty to love about this gorgeous pastel hued Love Wall Hook. Made from pressed metal and a generous 52 centimetres long, it’s a practical gift that’s sure to brighten up a space – and hopefully the hanging of hats. Priced $49.95, find them at Bed, Bath n’ Table. 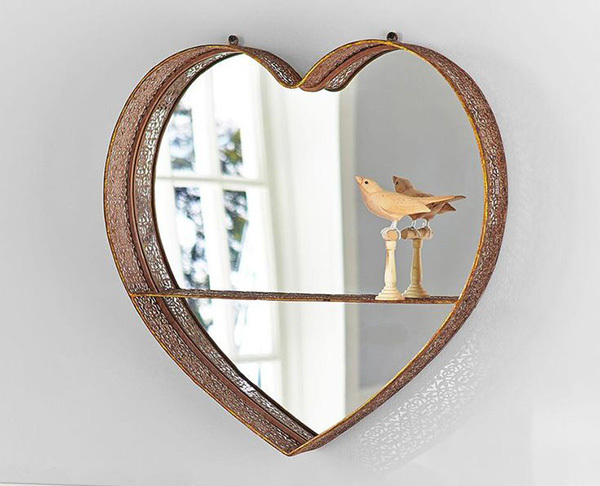 For another sweet decor addition, this beautiful heart shaped mirror fits the bill perfectly. A heart of gold it is indeed with its dainty metal border and shelf, perfect for showing off a treasured Valentine’s trinket or two. The Gold Heart Shelf Mirror is priced $99 from Pottery Barn Kids. If you’ve a child with a penchant for accessorising, you can’t go past the awesome heart themed leg and arm warmers from BabyLegs. A fabulous option for warding off a chill when it’s not quite cold enough for a complete outfit change, or for just a spot of fun! Shop a huge selection of BabyLegs at Babes In Arms, priced from $12.95. Feel like stirring up your loved one this Valentine’s Day? 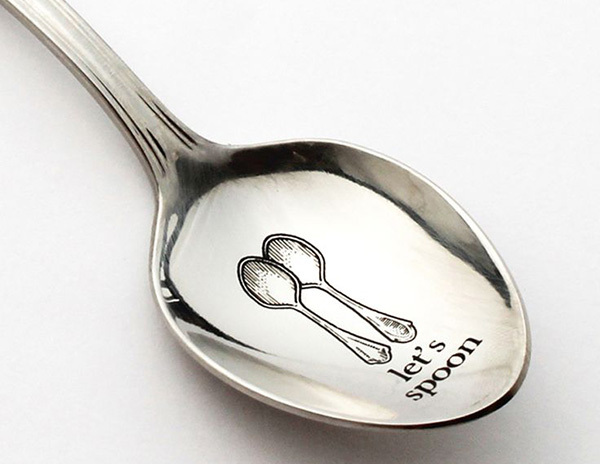 How’s about a novelty spoon for a cheeky pun with their morning coffee. The Foolhouse Let’s Spoon teaspoon costs $20 from Down That Little Lane. One of my favourites for any time of the year is a Laura Blythman print, but Valentine’s Day calls for the limited edition Candy Land print. 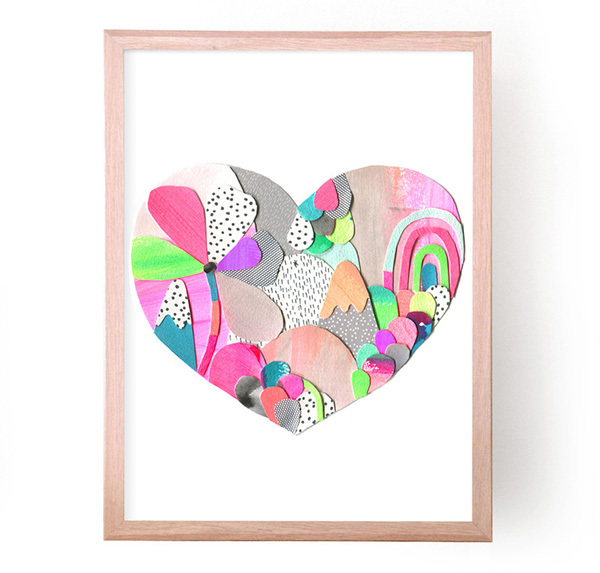 A carefully curated collage of colour and shapes made into a heart, it’s sweet art fun for young and old. Available in three sizes, the A3 size is priced $85. The fellas are a little hard to shop for when it comes to Valentine’s Day – I can see why many find themselves with a box of chocolates. 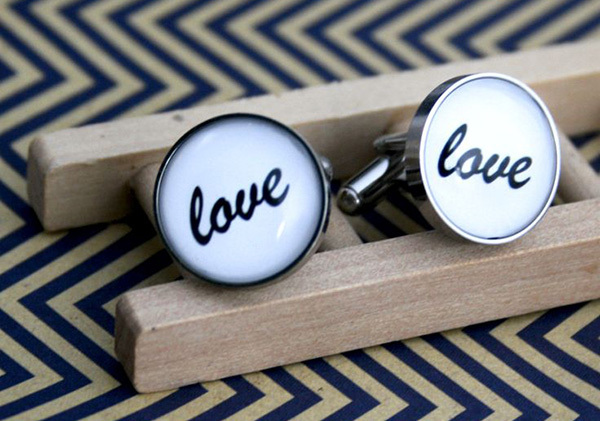 If your guy is a shirt wearing type and not afraid to wear his heart on his sleeve, he may well adore these Love Cufflinks from Mod Viking. Priced $45 for the pair, you can order through Down That Little Lane. The littlest Valentines will love having a firm grip on this Wooden Heart Teether from Smiling Tree Toys. 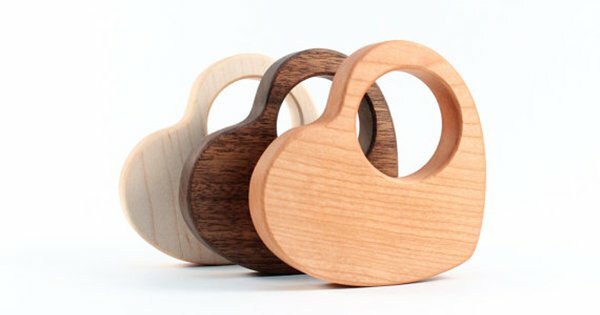 Organic and handcrafted from hardwood, it has a beautifully smooth finish for little gums and teeth. Priced $18.95, you can get yours from A Little Bit Of Cheek. A cute piece for your daughter’s jewellery collection – or one for a fun loving mum – is this Be My Valentine Pendant that’s sure to be cherished by its recipient. Priced only $29, you can find it at Hard To Find – with free shipping to boot. We’d love to know if you give gifts on Valentine’s Day. Let us know what you’re planning for your loved ones this year in the comments below!